Deliveries from a grocery store here will soon be arriving with no one behind the wheel. A fully autonomous vehicle began piloting public roads Tuesday with no backup driver, though it will be monitored by humans in another automobile. After almost 1,000 test runs with humans aboard modified Prius vehicles, deliveries launched Tuesday here using the R1, an automobile with no steering wheel and no seats for humans. The R1, when summoned, will travel within a one-mile radius of the Fry’s Food grocery store just east of the Phoenix Zoo. 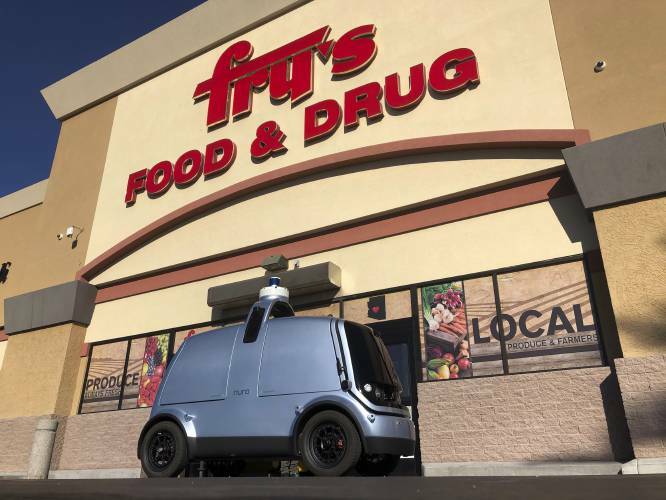 It will travel up to 25 miles per hour on residential roads, but stay clear of main roads or highways, according to Pam Giannonatti of Kroger Co., which owns Fry’s. “Through this exciting and innovative partnership, we are delivering a great customer experience and advancing Kroger’s commitment to redefine the grocery experience by creating an ecosystem that offers our customers anything, anytime, and anywhere,” said Yael Cosset, Kroger’s chief digital officer. Uber pulled its self-driving cars out of Arizona this year following the death in March of woman who was run over by one of the ride-hailing service’s robotic vehicles while she crossed a darkened street in a Phoenix suburb. It was the first death involving a fully autonomous vehicle. Waymo, a self-driving car spinoff from a Google project, has been offering free rides in robotic vehicles with no human backup driver as part of a test program in the Phoenix area for the past year. Earlier this month, Waymo launched a ride-hailing service available to about 200 people that will have a human behind the wheel to take control in case something goes awry. “We built a great relationship with Nuro, and safety has always been their top priority,” Giannonatti said.